Assistant Directors (the 1st AD) are one of the most valuable crew members on any production. Your 1st AD is responsible for on-set communication, department coordination, maintaining the shooting schedule, conflict resolution, and safety. Want to become a better 1st AD on set? Follow these 13 principles to fast track yourself. When creating a shooting schedule for the day, having a robust shot list template on hand is important. But what happens when you’re working with a director who doesn’t like making shot lists or storyboards? Try asking the director questions like “are you thinking of doing a wide and then two overs?” or “do you have a couple specialty shots that you want to do?” This will give you an idea on how much time to allocate per scene. If the director’s response is “I don’t know what I’m going to do yet,” get the Director of Photography involved. Let the DP know that the director might need some support to plan out the shots. NEED A BETTER SHOT LIST FOR YOURSELF OR THE DIRECTOR? DOWNLOAD THIS “ULTIMATE” SHOT LIST TEMPLATE FOR FREE. It’s during the pre production process that you analyze every scene to identify all the script elements needed. 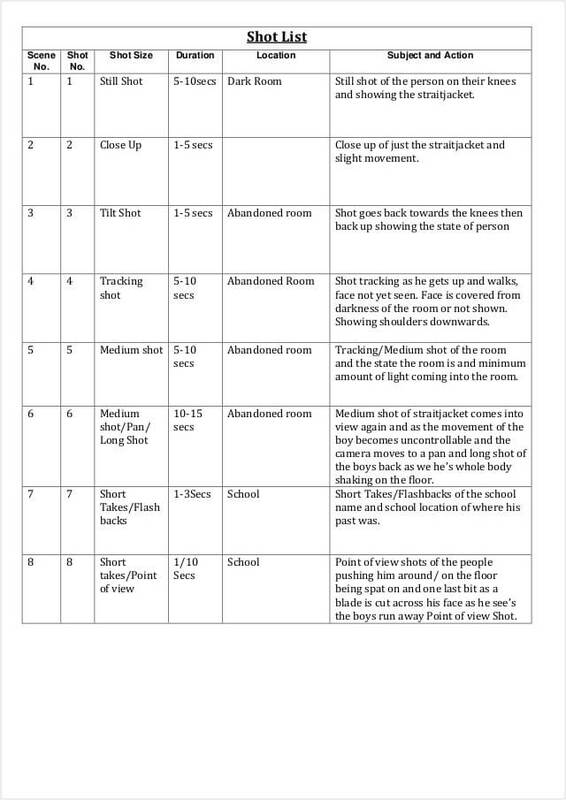 It’s with this information in hand that you can better understand prep time required for a shoot day; from steadicam set-ups to make-up and wardrobe for talent. This is then factored into your daily shot list template. Since shooting schedules don’t contain a great amount of detail, it becomes important to add notes somewhere accessible. If you’re using breakdown software like MovieMagic or StudioBinder, you can do this when creating script breakdown sheets. If you’re using a breakdown template in Google Drive, you can add a notes columns. Some of these broader notes (i.e. safety considerations, prep times, meal breaks) should also be included on the call sheet so the rest of your cast and crew can be kept in the loop. With StudioBinder, we allocate a place under every daily schedule line item for notes. This is an effective way of highlighting relevant notes for yourself, the cast, and crew. Get your core team (usually the Producer, Director, DP, Sound Mixer, and other key departments) on the same page by going over the shoot schedule, as specified on the call sheet. This is your best shot to let everyone know what’s expected of them. Don’t spend more than 5 minutes in this meeting. If your meeting takes longer, its a sign that you have to reassess and/or restructure your day. It’s better to take the time to figure out a new gameplan with department heads at the top of the day, than to be surprised by unattended consequences later. The shot list may need to be adjusted for many reasons; new shots, lighting conditions, changes to script or gear. Once the set is dressed, it’s time to walk through the scene with your Director, DP, Gaffer, Sound Department and Production Designer to double-check if the shooting plan should be adjusted. If something must change, you may be able to swiftly address it before falling behind schedule. As you’re nearing shooting completion of a scene, be prepared to walk through the next scene’s set-up the same way. Repeat this pattern to stay ahead of your schedule. What can ultimately bring down a production are the “unknown unknowns.” You can’t address issues that you don’t know exist yet. As the hub of information, it is the responsibility of the 1st AD (or 2nd AD depending on the size of the production), to collect the latest intel from various departments, and take preemptive actions to prevent issues from arising. Listen, look, ask, eavesdrop and do whatever is necessary to get the information you need so you can better reassess your plan. The single most effective strategy you can take is the MBWA (Management By Walking Around) method. The downtime between takes and setups (really any time you’re not rolling) is an opportunity to check-in with departments one-on-one. This has the added benefit of building rapport with your crew since they might communicate concerns in private that they normally wouldn’t in front of others. The best 1st AD’s are not only great communicators, but also strategic thinkers. They know what to say, when to say it, and how to say it. Here are some tips keep information flowing on set. There’s a reputation in the film world that assistant directors are constantly yelling. However true this may be, it’s not an effective way of garnering respect and importance amongst crew. Anyone that gets too eager about shouting minutia will get tuned out fairly quickly. Consider when it’s more effective to speak one-on-one. Establish timelines with each department for what’s next, then follow up to see how they are progressing. Provide a 5-10 minute heads up for the next scene or set-up. 7. Embrace Being a Problem Solver. It’s Your Job. Be a good listener. If you notice frustration brewing in a crew member, pull them aside and let them vent. It will only take a few minutes, but it’s critical in getting the person (or department) back on track. If you can build trust with your crew, they’ll feel like they have a friend on set watching out for their well-being. Take ownership of a mistake, even if you didn’t make it. Let your entire team know that you’re working on a solution as they speak. This will help build confidence and respect from your team. Involve only those required. If an issue pops up that is holding up the shoot, and it doesn’t directly involve by-standing crew, adjourn them. Tell everyone to take a quick 5-minute coffee break while you try to resolve the issue. This becomes especially important if things get heated. No need to drag the energy of the crew down. Never point fingers. This should never be an option. Yet, it is common amongst many 1st ADs to blame others. The buck stops with the assistant director. Not only does finger-pointing undermine trust with those people, but it’ll make others fearful to approach you in the future. Don’t take sides. If there’s a conflict between crew, you need to speak with them separately to understand every perspective and find a mutual solution. Oftentimes, all they need to do is vent to someone to alleviate the tension. Don’t lecture. Nobody likes feeling like they’re being talked down to, so briefly make your point and move on. Don’t let tension escalate. Word-of-mouth travels fast on a set, so anything negative that is uttered has a chance to infect the energy of the cast and crew. The average day of shooting can be upwards of 12+ hours so you’ll need to be extremely efficient with your use of time. What can you do to stay ahead of schedule? Your estimates can potentially get thrown out the window if unexpected issues arise on set. Even something as simple as adding an extra 15 minutes of contingency to every scene can pay off. This is especially important when working with a new crew since you don’t know how effectively they’ll work together. If your crew is a bit green, add 30 minutes padding (at least). Get a head start on time-consuming efforts like prosthetic makeup, production design, or setting up a complicated shot. If something is stalled (i.e. the actors are still in make-up), find something that can be completed in the meantime. Maybe it’s a perfect time to grab that quick insert or establishing shot! Building a foundation of trust and respect starts with learning people’s name. Nobody likes being referred to as ‘hey’ or their crew position. While it’s not expected to know everyone’s name on day one, this is one of the reasons a call sheet exists. Review the call sheet and memorize all the key cast and crew names. Most modern film production management software like StudioBinder makes this process easier by including cast and crew profile images as the call sheet is generated. This way you can put a name to the face when you’re on set. Sounds easy, right? Thanking people only takes a second and will motivate them to work harder. Treat everyone on set equally because all jobs matter, from the P.A. to the Director, recognize that every job has its own challenges and thus deserves empathy and respect. The best way to say thank you is to mean it. Make it a goal to thank everyone on set at one point or another. You’re setting the tone for the production, and people vibe off your energy, so lead by example. Keeping momentum is the key to having a successful shoot. Food and drink selections play a big role in maintaining energy all day. Although feeding crew is not directly the job of the 1st AD, you can definitely weigh in. Some talent can be sensitive. Building trust and respect with your actors is crucial in keeping them upbeat and preventing a scenario where they may walk off. Being a 1st AD means you have tons of interaction with talent so it’s paramount that you establish a good relationship early on. We all have to deal with it. Difficult talent and crew on set. Read how Angela Tortu, 1st AD behind projects like Entourage and Scrubs, breaks down 3 Ways to Work with Difficult Cast and Crew. What can we start prepping? What should be broken down? What should be finished now? 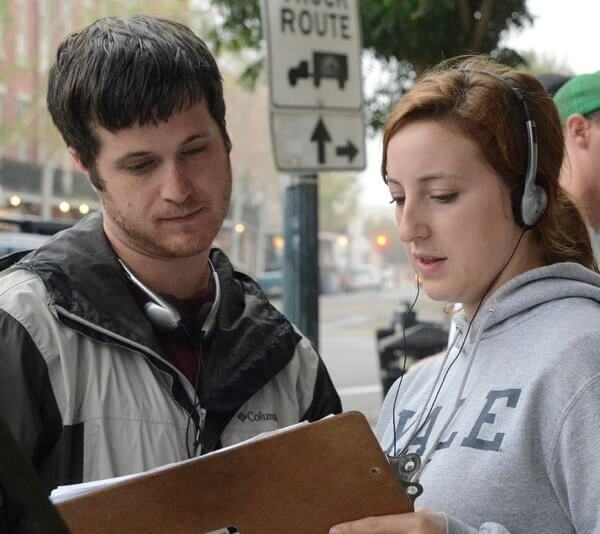 We hope these best practices were helpful on your journey to becoming an even better 1st AD. We know there are no magic bullets, so above all else, follow your instincts. Did we miss anything? What are some other ways you’ve been able to grow as an 1st AD? Share your ideas in the comments below. always a good idea to include the sound department when doing a walk through. They need to anticipate issues, especially boom challenges. Be really Involved in Pre-Production and communicate exceptionally well. If you’re not already an amazing communicator, you better get cracking on your communication skill set ASAP. As someone who liaises with the Director and pretty much everyone else on set, stellar communication skills are the ultimate key to your success in this role. Thanks Jason! We couldn’t agree more. Are we missing any critical points that we should include? Studio Binder is close to public launch- just sign up on the front page to get early access and pro discount.